We've already toured Lower Manhattan on another bike tour and wanted to cover ground in Central Park. August is obviously warm so would take a long time to walk round it... and we walk a lot in the city anyway.. plus we love bike tours. No need for helmets by law unless under 14 though we decided both children should wear them anyway. We did a 2 hour tour travelling up to the top of the park East side first and back down the West side again taking in all the spots; Castle, Fountain, John Lennon Memorial etc. It was a very warm day when we did it.. circa 30 degrees centigrade (sorry don't do fahrenheit now.. but just converted it to 86F). The park road is undulating but manageable on the bikes with gears. Traffic only enters the park for a small area on lower east side though its very steady and slow and certainly NOT busy. Most traffic is runners and walkers. No water was supplied so would recommend you take your own. One of our bikes had a front basket. There is nowhere to leave bags so dump anything at your hotel prior to meeting the guide at the designated spot.. in our case it was 1792 Broadway, New York, NY 10019 (on 58 street and broadway)- infront of Argo Tea Cafe. Easy to find. I surprised my husband (who loves to bike) with a private bike tour of central park for his birthday and we had an amazing time! Tony gave us a truly wonderful tour. Communication by email and text leading up to the day was seamless. I am not a great biker, doing a tour with just the two of us was perfect for me and Tony was very patient, always stayed close and made it easy to enjoy the park and ask questions even for a very amateur rider. He also would stop at any spot we wanted, and we had plenty of time to take pictures. Would highly recommend it to any couple who wants a guided view of central park! Central Park is just gorgeous, there is so much to see and do there. Pearl our tour guide just made this so much better, she is an absolute character. She is a wealth of knowledge on the park but her personality just stands out. It was amazing to see how many other guides knew her and would come up and say hello while we were cycling around. I've got some sacrum issues and was a little worried about being on a bike for 2 hours but we had plenty of opportunity to get off and have a little walk to break it up. This is an absolute MUST do - seriously do yourself a favour and request Pearl. 10/10. We rented two bikes for our guided tour for 3 hours. The bikes were in very good condition and worked well while riding through Central Park. From the starting point to Central Park are no more than 2min walking. I can only recommend this company. Wir haben uns hier für 3h 2x Fahrräder gemietet. Die Fahrräder waren in einem sehr guten Zustand und haben während der Fahrt durch den Central Park einwandfrei funktioniert. Von der Mietstation zum Central Park sind es zu Fuss, keine 2min. Ich kann diese Stadion nur empfehlen. We did a private VIP tour with Tony. We had two adults and two kids, ages 10 and 12. Tony provided interesting and useful information, and was accommodating for the kids (whether it was slowing down, pointing out sites they would be interested in, or stopping for unscheduled bathroom breaks). We felt that if we had done a regular group tour my 10-year old wouldn't have been able to keep up, or we wouldn't have heard all of the information provided as we likely would have been at the back of the group. We loved seeing all aspects of the park, including places that tourists typically don't go. It was fun and active (but not too much), and a nice change of pace from the bustle of the city. We would highly recommend this tour, especially for families with older kids and teens. We spent the morning with the wonderful Tony. He’s full of knowledge, stories & history and takes iou to off-the-beaten path spots (in addition to popular spots. We toured from 9am-noon and had a great time with my 14 year old daughter, and my sister. Would recommend to all. We rented seven bikes to ride for a few hours in and around Central Park. We rented for a period of two hours, which was sufficient for four short stops, purchasing of drinks, ice cream as well as photography. Great bike paths around the entire park. The bikes appeared new and we had no problems with it. The lessor also gave a discount in addition to the prices shown in the price list. This activity was absolutely amazing and we had one of our finest moments throughout our stay in NY this afternoon. Suitable for anyone who can ride a bike! Vi leide sju sykler for å sykle noen timer i og rundt Central Park. Vi leide over en periode på to timer, hvilket var tilstrekkelig for fire korte stopp for innkjøp av drikke og is samt fotografering. Flotte sykkelveier rundt hele parken. Syklene framstod som nye og vi hadde ingen problemer med disse. Utleier gav dessuten rabatt utover de priser som framkom av prislisten. Denne aktiviteten var helt fantastisk og vi hadde en av våre flotteste øyeblikk under hele vårt opphold i NY denne ettermiddagen. Passer for alle som kan sykle! We wanted the kids to see Central Park, but we didn't have a lot of time in our schedule. We booked a private two-hour tour which was perfect for us. Tony was a fantastic guide and so knowledgeable about the city. We chose this bike tour based solely off of Trip Advisor reviews. We are tremendously happy with our experience. Highly recommend! 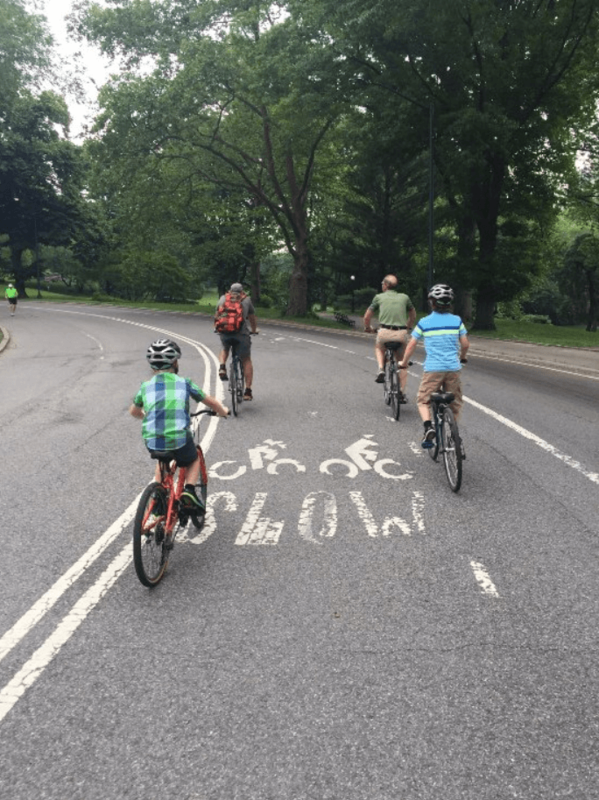 Our family of 5 took a private bike tour of Central Park with Tony on our recent visit to NYC and really enjoyed it. We have kids ages 13, 10, 6 and a private tour was the best way to go. Tony showed us all of the major sites within the park and had great knowledge/history of each. Although we probably could have rented bikes and just rode around the park on our own, we would have had no idea the significance of what we were looking at. I feel like we saw it all in the 2 hours with Tony. It was one of our kids favorite activities in NYC for sure!